These are 10-day-old White Homing Pigeon squeakers. The birds we will be shipping to you will be much larger than this in size. Can you believe that in just 25 days they will be flying? They grow very quickly. A breath taking white dove release business is truly unique and provides a lasting impression. You can build your business so that you can perform dove releases for weddings, funerals, and other special occasions just as we did back in 1989. You'll need a loft to keep your birds protected from weather and critters. You'll want to get the very best birds available to you, so you save time, energy, and money for the long term success of your business. When I mention "saving money", I am not suggesting you go out and find the cheapest birds you can find. I do ,however, suggest you purchase the very best birds you can find, regardless of the price, as this is the most important asset in your business success. You will then need to train your birds to come home, as well as care for them daily, and be professional with all the details of the business. There are people out there that already make anywhere from $35-70k after their second year of operation(Results will always vary depending on the individuals experience), and we know several who make more than this. How would $275,000 per year sound? Well it's already been done. If you go into this business to make meaning and to fill a need, you can do very well, and you can make money! This type of investment in this special niche market can allow you to make a return within a short time of performing a few dove releases. It has been our experience that if you learn to market this type of service correctly to the public, it can be rewarding in many aspects. Let us help get you started off correctly the first time by providing VALUABLE beautiful white doves to add to your business. Visit our site frequently, as we will be posting some great products that will enhance your success in the dove release business. We offer insurance, banding, DNA testing, and vaccinations for our birds, as indicated on the detail pages for each bird. We strongly recommend that birds be vaccinated for PMV. Guaranteed Sexing of Birds. This is an additional fee which can be selected at time of checkout. This DNA test is sent off to our lab, and takes 1 week to get the results back. If you would like to add these items, simply check the appropriate box when placing your order. We will send you exactly what you order. All birds are shipped via USPS EXPRESS Mail. See our Shipping page for details. All pricing totals are calculated at final checkout. Shipping Fees are also listed on checkout page as well. This upcoming Year (2016) We will be promoting offspring off our famous Belgium Imports. Our White Janssens will still be available, but in fewer qty. To order birds below, simply click on the item and it will take you directly to the secure shopping cart. Excellent colored racing homing pigeons at an affordable price. We breed white birds from colored birds in order to retain good genes. White fantail doves provide a lovely added touch to any occasion. These white fantail doves are meant for decoration. 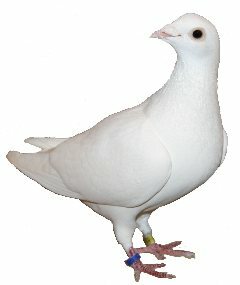 White Racing Homing Pigeons are the only type of birds that should be used for release in the White Dove Release Business. White ring neck doves (also known as "love doves") provide a beautiful added touch to any occasion. These love doves are meant for decoration, rather than flying. Fancy birds we sell on the side to those who are interested. Prices and availability vary. The White Dove Release Assessment + 1 Month Coaching and Consultation Package Specifically for the new business owner. IF YOUR DREAM IS OUT THERE TO OWN A BUSINESS, THEN WE WILL SHOW YOU HOW TO EXACTLY ACHIEVE IT IN THIS INDUSTRY!! Take our valuable assessment�survey to find out what�will be�required�to have your own White Dove Release business! This is a very personalized service we offer,�and we even�go over the results with you once you've completed it. This provides all of our customers the opportunity to then make an informed, educated�decision about getting started in this type of unique industry. But it doesnt stop there....1 month of coaching would typically cost $2,000 for you to have the rare opportunity to work with the owner and founder of this business. This Assessment�Survey now allows you to receive a (1) month consultation for your startup. In addition,�you will�receive a 15% Discount Credit that may be applied towards any bird purchases totaling over $1500.00. This new option is part of a ongoing�quality control initiative�that can be used to help those entering this industry make the entire industry better as a whole. We are all in this together, to serve the public with the respect they deserve on a professional level.